In the last post, I discussed building up the bottom end. Now on to the top end. I rotated the engine into its upright position on the engine stand. Next I turned to getting the head ready to go. 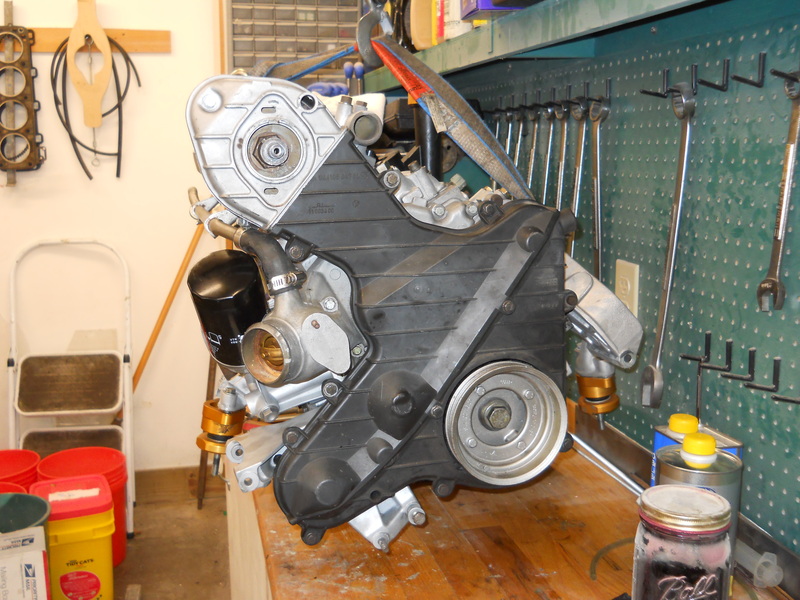 The machine shop had dipped the head and performed a simple 3 angle valve job on the valves. I had them leave the valves loose, although they would have gladly have installed everything for a fee. Before I reassembled the head, I had a task to perform. When I took off the metal housing where the thermostat and heater hose attach, one of the bolts sheared off in its hole. I tried to centerdrill the bolt remnant and take it out with an Easy Out. I have never had any luck with an Easy Out and this time was no exception. I have learned to not lean on an Easy Out very hard, as they will just break off and then you have a bigger problem. I continued to try and center drill the bolt but such small drills want to walk on you and pretty soon I was chewing up sound aluminum around the hole. I finally got the bolt remnant out but the remaining hole was pretty ugly. I decided to insert a Helicoil. If you are not familiar with Helicoils, their website does a much better job of explaining them than I can. For really critical connections on old Porsche 911 magnesium crankcases, I see that a lot of folks use a Timesert product. For a water hose connection, this would have been overkill. After I got the holes repaired, I proceeded to install the valves. 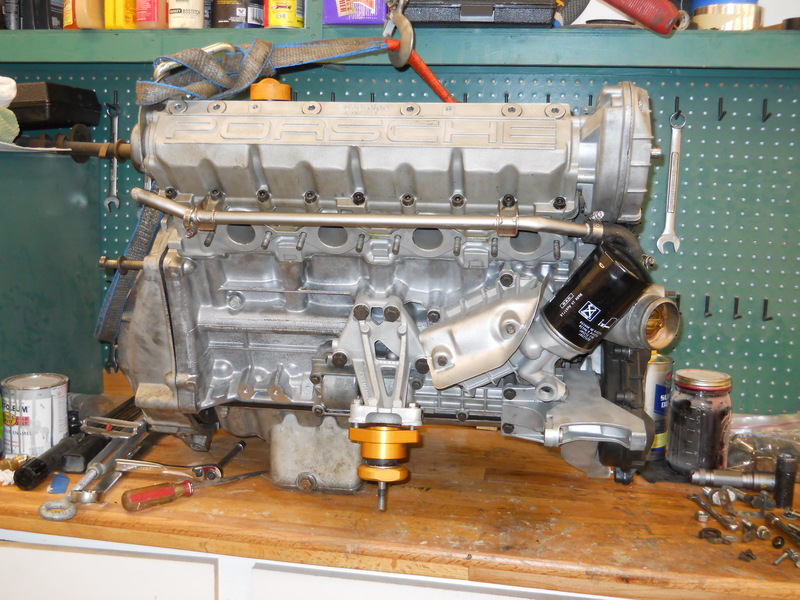 There are some free height measurement checks of the valve springs in the shop manual that you can verify. Mine were close enough. There are also some compressed height measurements that are controlled by shims under the spring seats. I checked these as best as I could, with measurement being problematic in the confined space available. I used a dial caliper, using the part that extends from the end, to make this measurement. All were within spec. I don’t have an official valve spring tool but rather use my press and a special wood block that I made that fits over the stem and allows access to insert the collets. It takes a little longer but the price is right. 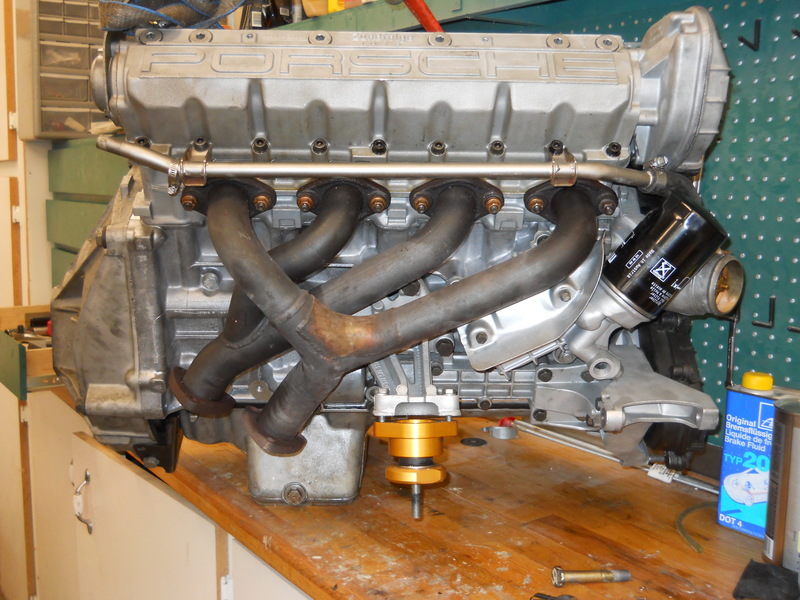 Once all the valves were installed with their springs I put the valve stem seals over the ends. I said previously that no work was done on the block but I did have the machine shop clean out the tapped holes were the long head studs go. I had purchased new head studs for my previous engine rebuild. I removed them from the old block and installed them into the new block. With the holes cleaned out by the machine shop, I was able to install them with my fingers. It was time to install the head gasket and the head. In retrospect, I wish that I had had the machine shop take a very small skim cut on the top of the block to clean it up. I cleaned it up as best as I could with solvents and non-abrasive products before I inserted the pistons, etc. Regardless, you want the aluminum surfaces of the block and the head to be as smooth and clean as possible to ensuring good sealing with your head gasket. I used as “standard” Porsche headgasket that comes with the top end gasket kit that I got from Paragon Products. As far as I can tell, it does not require any special sealants. 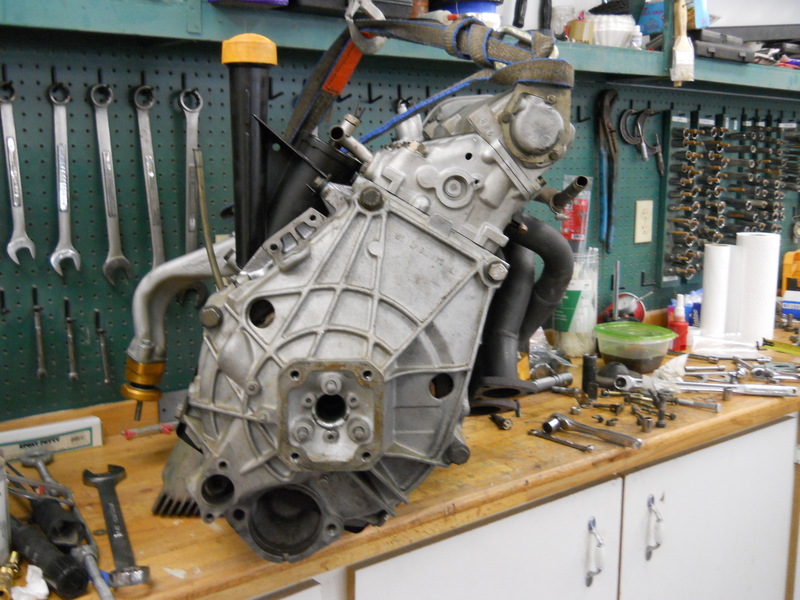 Next I carefully lowered the head onto the 10 studs and brought it down onto the head gasket. Then installed the proper washers and nuts on the studs. The Porsche shop manual shows a procedure for tightening the head gasket which is what I followed. Now it was time for the cam tower. I had replaced on the gaskets and seals on my cam tower on the previous rebuild. Here is one area where I took a little bit of a risk. The shop manual recommends that you replace the hydraulic lifters if you have shredded a bearing. I would assume the fear is that some small metal particles introduced into the oil system made it up to the head and into the lifters. I decided to re-use my lifters. I had left them soaking in a pan of oil since I took them out. Back in they went. When I did my first rebuild I purchased a set of extended length metric allen keys, the kind that are a straight shaft that ends in an 3/8″ drive socket. I do not know how you would reach the internal fasteners in the cam tower without this tool. Of course, before you tighten down the cam tower the engine must be “in time” i.e. the crank should be on top dead center and the cam drive gear at the front of the cam tower should be lined up with the proper timing mark. Otherwise you will certainly crush a valve or 2 as you tighten down the cam tower and extend the 2 valves that are “up on their cam”. From here forward, your attention will turn to the ancillary items that attach to the engine. I want to mention the oil cooler. The N/A 944 engine does not have an external oil cooler like the turbo. It has an oil to water cooler that attaches on the lower right hand side of the engine, below the oil filter. For an engine that has had a bearing failure, Porsche recommends that you replace the little heat exchanger unit inside the cooler, I would gather due to the confluence of oil with metal bits and small passages. I did but it was an “ouch” moment when I got the price. In this case, better safe than sorry. During reassembly of the oil cooler, be careful to ensure that the oil pressure relief valve is aligned and free to activate. Other external items of course include the front timing belts. This being my 3rd time with timing belts I was an old hand by now. I used the tension tool that I got from Arnnworks. It works really well! Of course, before you can install the belts, you have to install the balance shafts and their covers. Nothing special about this step that I can tell. Just follow the Porsche manual. Other external items installed where the intake manifold, exhaust manifold, motor mounts, water pump, oil filler tube, alternator, clutch, and bellhousing. 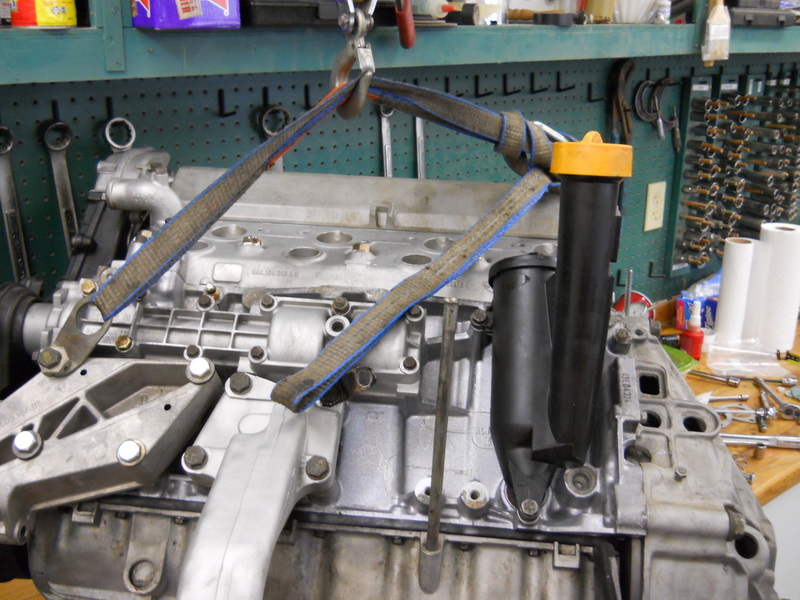 During all this work, I had the engine attached to my hoist and balanced on my work bench. This sure beats having to bend over and work on it while it is on the floor! Finally I was ready to install the engine in the car. This part has been difficult for me in the past, as far as getting the engine to go that last inch as the end of the driveshaft has to engage the pilot bearing in the flywheel. This time, since I had taken out the torque tube and differential, I left the torque tube installation loose and pointing downward. I guess this must have been helpful because the engine engaged completely with little fuss. I finished hooking up the engine, added oil and coolant, and fired it up. It started easily with no bad noises so I was happy. It was on to final assembly in prep for my first track session!